As the aircraft carrier USS Dwight D. Eisenhower entered the Mediterranean Sea this week, Chief of Naval Operations Adm. John Richardson told lawmakers on Capitol Hill the deployment has historic import for the Navy. Speaking at a meeting of the Congressional Shipbuilding Caucus on Tuesday morning, Richardson provided new details about the Navy’s missions in two high-profile regions. American warships are operating in the South China Sea, where intensifying territorial counterclaims and aggressive actions by China are responsible for heightening tension, and the Middle East, where two carriers — the Harry S. Truman and the Eisenhower — now are positioned to carry out airstrikes against targets of the Islamic State in Iraq and Syria, or ISIS. Two conducted coastal training operations, while four were forward deployed, including Eisenhower, Truman, the John C. Stennis in the South China Sea, and the Japan-based Ronald Reagan, which began its 2016 patrol in the Pacific last week. “I wanted to be there because of course we’re all getting reports of how important and busy that part of the world is, but when you’re there on the carrier, you look around and there on the starboard quarter is a Jiangkai frigate and on the port quarter is the AGI, [Dongdiao-class Electronic Reconnaissance Ship], an intelligence collection ship from the People’s Liberation Army Navy,” Richardson said. “You get to count the number of sorties that they’re doing overhead, you get a real sense and you can feel it, how busy they are, what this new normal is that’s being established,” he said. In the Mediterranean, where there are now two carrier strike groups ahead of the Truman’s redeployment to its homeport of Norfolk, Virginia later this month, Richardson said the role of providing maritime security went beyond the significant number of airstrikes launched on enemy targets in Iraq and Syria. 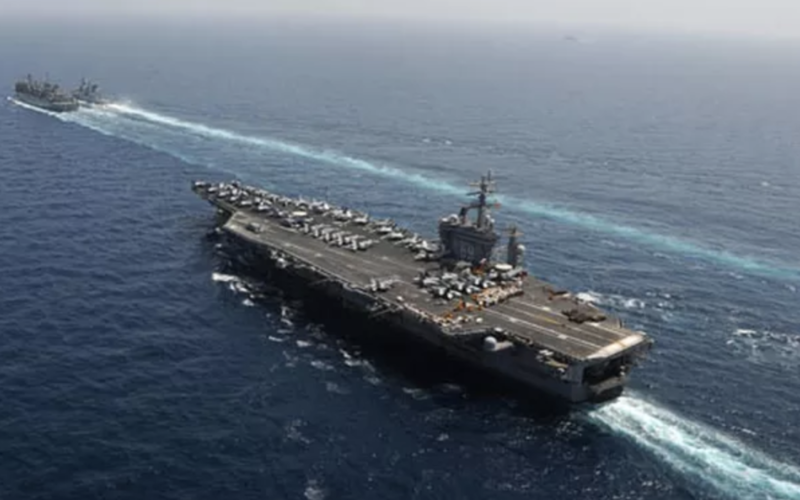 Elements of the Truman strike group that remained behind in the Persian Gulf while the carrier transited to the Mediterranean provided a steady state-presence to support allies in the region. Meanwhile, Richardson said, ships and aircraft provided intelligence, surveillance and reconnaissance. “They bring a tremendous amount of awareness,” he said. In light of ongoing operations and high operational tempo, Richardson said there was a mandate for new ship construction to be faster and more innovative. The “truisms” that it should take three to five years to design a ship and another five to build it might not have to hold true going forward, he said.